Relatives of a Filipino hostage freed in Iraq celebrated his release with cheers, tears and beers on Tuesday as the Philippine president defended her decision to yield to the demands of his kidnappers. 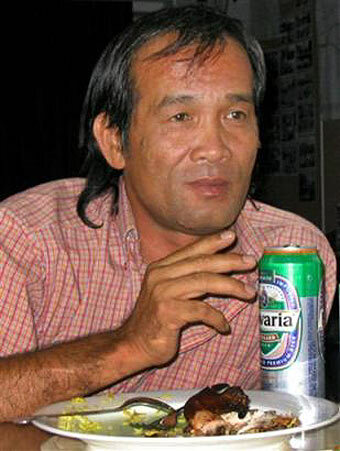 Angelo de la Cruz, a 46-year-old truck driver and father of eight who had been threatened with beheading, said his abductors had not hurt him during two weeks captivity that ended a day after a 51-member force of Filipino troops and police quit Iraq. President Gloria Macapagal Arroyo, breaking a public silence she maintained throughout the crisis, said she had no regrets for having pulled out the force one month ahead of schedule in order to save the life of a compatriot in peril. "A father of eight, Angelo has become a Filipino Everyman, a symbol of the hardworking Filipino seeking hope and opportunity," she said in a live broadcast announcing his release. "With over one million OFWs (overseas Filipino workers) in the Middle East and over eight million Filipinos the world over, my government has a deep national interest in their well-being wherever they live and work." Arroyo's decision has strained ties with the United States and Australia, both key allies of the Philippines, which have condemned the move as capitulation to terrorism. Diplomats and analysts, however, see little long-term impact given U.S. interests in helping the predominantly Catholic Philippines battle several Muslim insurgencies in the south of the country, some of them linked to al Qaeda. The U.S. embassy in Manila issued a statement welcoming de la Cruz's release without reference to the terms. De la Cruz looked tired and drawn but fit in television pictures from Baghdad, where he was released into the care of the United Arab Emirates embassy then moved to the Philippines mission pending an expected return home via Abu Dhabi. He told his wife Arsenia, who had spent an anxious week in the Jordanian capital Amman, that his kidnappers had not mistreated him. "With God's help, no," he said when she asked him in a televised telephone call whether they had hurt him. 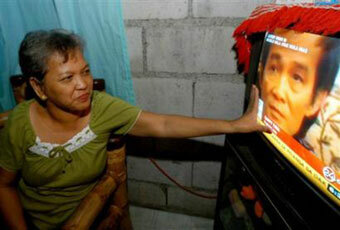 In Buenavista, a dirt-road village of low houses with grass or tin roofs about 90 km (55 miles) north of Manila, members of de la Cruz's extended family shouted "Long Live GMA" in a reference to Arroyo as they watched her speak on television. "Thank you for saving Angelo to beloved Gloria and God Almighty ... Thank you, Philippines," said his sister Nelia. Another relative, a great aunt, jumped for joy then buried her head in her hands to hide tears while other family members feted de la Cruz's freedom on beer, noodles and chicken. Government officials had told the family last Saturday that he had been released only to row back and shatter their hopes. De la Cruz was abducted two weeks ago near the town of Falluja, west of Baghdad, while trucking fuel from Saudi Arabia. His plight transformed him overnight into an unlikely hero, a symbol of an army of expatriate workers whose annual remittances of $7.5 billion are the lifeblood of families back home and vital to the indebted country's economy. Benefits that now await the family include a plot of land for a new home from a local construction company, scholarships for several of the children and a promise of a job for de la Cruz himself from a member of the Philippine Congress. Hostage-taking has been a tactic used by some rebel groups in the Philippines, in particular the Muslim fundamentalist Abu Sayyaf group. 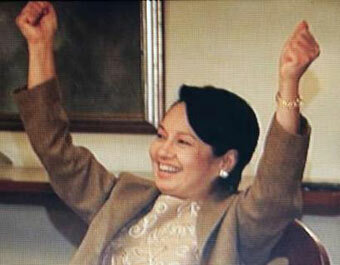 Arroyo made clear that her action in Iraq did not mean the government would capitulate to kidnappers at home. "Every life is important. Angelo's was spared and we rejoiced," she said. ".... but our people must also know that will not always be the case. Innocents will come into harm's way and circumstances may not allow such a successful outcome."